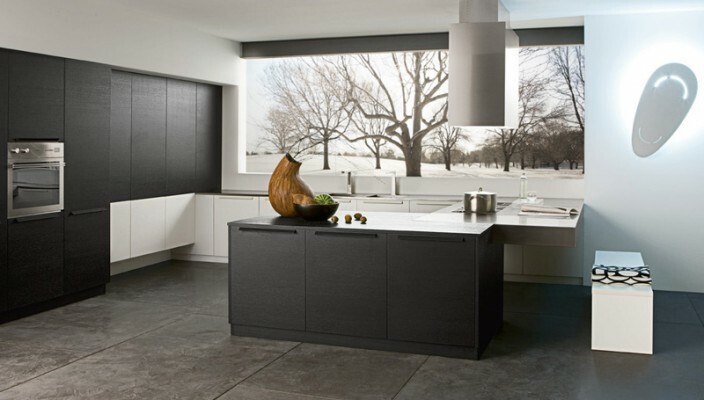 Kitchens with moderate area require to be very carefully arranged with the components. The huge window space that has been provided on the wall of the kitchen provides a perfect view of the outside surrounding because of the complete glass panel on the wall. The beautiful scenery outside the kitchen is rendering a glorious ambience to the whole kitchen area as it gives a peaceful and pleasant environment for the people who are in the kitchen. The kitchen is set up in a limited space and the color scheme is tremendously complimenting the available space. The black and white color scheme which has been applied on the various accessories, furniture and walls are perfectly blending with each other and portraying a highly sophisticated image of the kitchen area. The kitchen has adopted a contemporary approach to the components of the kitchen and the electric chimney, wall mounted oven, etc. are justifying this approach and are portraying the modern concept of kitchenware.